The Ford EcoSport is one of the top SUVs in the subcompact SUV market. It has been ranked highly for safety, reliability, performance, and interior comfort. The EcSport is one more of the more fuel-efficient models on the road. It provides power driving adjustments, user-friendly options through Sync 3 infotainment system, and a newer model that has been re-designed inside and out. The all-new 2018 EcoSport is a pretty athletic vehicle for the subcompact market. The base engine gives great pickup, and it's a good crossover if you want something spacious that provides smooth handling as well. The EcoSport comes standard with a turbocharged, 1.0-liter three-cylinder engine. You can bump that up to the 2.0-liter four-cylinder engine as well. The EcoSport gets 29 mpg on the highway for its base class. However, the larger engine gets a bit more in terms of handling and acceleration. 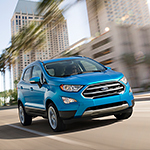 Come see the all new EcoSport in action at the M & M Ford dealership.